Silicon Valley has transformed our experience of the built environment and the complex systems within it to an extent never before conceived by any planner or architect. Uber, AirBnB, Google, Trip Adviser, Twitter – all have drastically affected how we consume and experience cities. Each of these companies addressed a single market problem via technological innovation, and succeeded by attracting a critical mass of users. Lines of code, intentionally or otherwise, have rapidly outmaneuvered the lines of architectural blueprints in programming our cities. Imagine, then, the possibilities of cohesion between these two toolsets: of architects who are, theoretically, tasked with designing for a public good, using the tools that are actually redrawing our cities. I believe that designers, as programmers of spaces, objects and experiences, hold the potential to craft this emerging city cyborg, and more importantly determine its purpose. In his 1994 thought piece The Generic City, Rem Koolhaas describes a city where “serenity... is achieved by the evacuation of the public realm”, largely as the result of “urban life[’s] cross over to cyberspace”. To a great extent, urban life has crossed over to cyberspace. We can receive deliveries within hours, date through apps, know who is where, and no longer need to know the name of our neighbourhood streets thanks to Google maps. These are great functions. But to avoid Koolhaas’s vision of a public realm devoid of social purpose, we must simultaneously design an environment that offers experiences greater than those offered through highly functional apps. The Generic City was intended as a provocation. But a link between our reliance on apps focused on the individual, and our reliance on what the built environment and city has to offer, is undeniable. Designing for a digitally mediated city that aspires to invigorate and inspire the public realm, rather than bypass it – that uses the interplay between lines of code and the lines on architectural blueprints – requires the designer to consider both the physical and digital layers of the urban experience. An early example of the application of this type of thought was the “Fun Palace”, designed by British architect Cedric Price, theatre director Joan Littlewood and cybernetic scientist Gordon Pask. The project, conceived in 1961, aimed to create “unimagined sociality” through a large adaptive structure that blended learning, work, the arts and “fun”. It was to be an automated set of public spaces, mediated by cybernetic algorithms, and actuated through a variety of spatial and interactive mechanisms. Gantry cranes would reconfigure spaces to meet the needs of a particular performance, while another space would be configured to support an educational workshop. My practice, Chomko & Rosier, seeks to re­examine this interplay between architecture, technology and culture. Our studio is mid­way through producing “The Lost Palace” – a project for Historic Royal Palaces, which will allow visitors to explore the Palace of Whitehall, which was largely destroyed by fire in the late 17th Century. Taking place on the streets of contemporary Whitehall, this compression of several hundred years is mediated via a series of haptic, physical, audio and interactive mechanisms powered by digital technology. Urban experience designers can draw upon these types of experiments, while also engaging with the immense critical narratives emerging around data and our use of technology. They can decide which problems to address within our cities, and pursue the far greater task of designing our digitally mediated urban experiences. They can craft mechanisms, spaces and systems that encourage, suggest and assist us, while providing rich urban experiences – whether local information, wayfinding, transport, events, history, socialising, or any combination. Our studio was able to play with this idea through our public art project “Shadowing”. 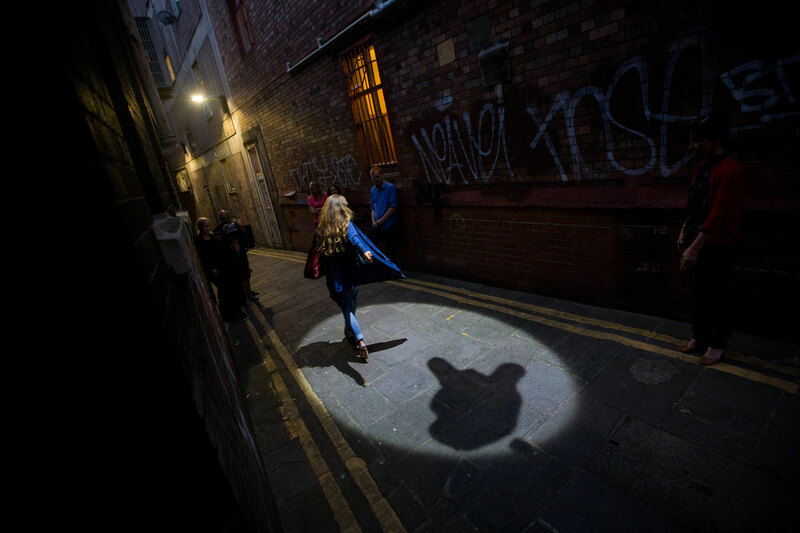 The project gave streetlights the quality of memory, allowing them to record the shadows of those who walk underneath to be played back for the next person. As an art piece Shadowing captures and then enhances the core quality of any city: the people who share it. As a piece of design, Shadowing offers a glimpse into the potential for technology to provide a layer of experience on our streets and infrastructure. The tools available to designers through software are unprecedented. They can dramatically alter our perception of a space, a historical event or an entire city without laying a single brick. So as the Generic City surges forward, propelled by digital technologies, and we wander towards the theatre exit lights guided only by a backlit screen, let us attempt instead to turn the city into theatre. 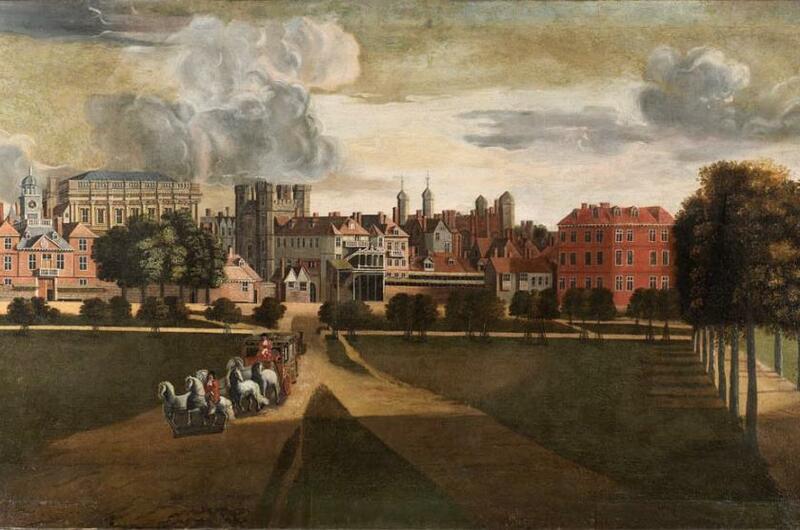 This past summer, The Lost Palace allowed people to explore the lost Palace of Whitehall, 300 years after it burnt to the ground, of which only the Banqueting House remains. Historic Royal Palaces worked with Chomko & Rosier, and a diverse team of collaborators including theatre makers Uninvited Guests, sound artist Lewis Gibson and app developers Calvium, to create an experience that allowed visitors to uncover the lost palace on the streets of central London. The challenge at the heart of The Lost Palace was not only how to let a visitor explore a palace that no longer exists, but how to do this within a context as busy and complex as the streets of Whitehall. While Whitehall was once the seat of royal power, today it is the seat of government with politicians, tourists, police and the military negotiating one another between the dominant neo-classical architecture. We chose to utilise this extraordinary public realm, referencing the current situation, blurring boundaries between past and present, real and imaginary, real-time and pre-recorded. These conditions led us to create an audio-based experience that would allow visitors to wander the streets where the Palace of Whitehall once stood, and ‘tune in’ to the stories that were lost. The driving concept behind the experience was that the past is just beneath our feet - and through technology we could create the sensation of reaching down into that past. We created a handheld device through which visitors could connect to the invisible layers of history within the streets, as if they were picking up on sounds and echoes still reverberating from the past. A complex mix of technologies allowed this experience to happen. While sharing the basic mechanics of a location based game such as Pokemon Go, The Lost Palace device created a multi-sensory augmentation of the existing space, through haptics, immersive binaural audio, and the ability to perform actions within these historic environments. Architectural installations were embedded in the public realm, creating moments where the Palace of Whitehall began to physically bleed back into the contemporary streets. 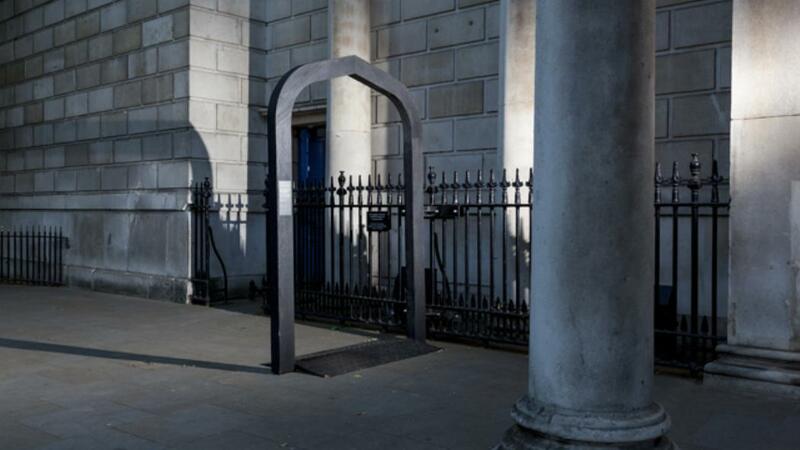 Burnt oak replicas of the gothic doorways, archways and sculptures that once adorned Whitehall were placed where they once stood, juxtaposed with traffic lights and street signs, and held an integral role in the visitor's experience. These installations were interfaces between past and present; embedded with hundreds of NFC (Near Field Communication) stickers, visitors were able to touch their device on the burnt wood to enter rich soundscapes. Visitors were able to touch the archway of the Great Hall and enter into the first performance of King Lear by Shakespeare to James I, or hold their devices against the Tudor posts in the Privy Garden to overhear passing gossip from the decadent Stuart court. Where modern buildings lined up with the Palace’s footprint, they were incorporated into the experience. One wall of the Ministry of Defence stood in for the Palace wall, and visitors were given the chance to use their listening device as a parabolic microphone, pointing it at various windows of the MOD, picking up on the events that once happened in the rooms of the palace. The audio itself also embodied this idea of worlds melding. The audio was recorded by placing microphones inside a dummy human head. By placing the microphones in the same place where human ears are, it allows the recording to convey an unimaginable spatiality and realism. The general information and navigation guide tracks were recorded on-site with this binaural technology, capturing all the footsteps and sirens, giving the guide voice a sense of presence and realism. At key moments in the experience, live audio from headphone-mounted microphones was layered into the soundscape, further melding the present into the past. The Lost Palace feeds off the richness of its existing context. Rather than constructing a virtual world that is experienced in isolation, the virtual and the reality of contemporary Whitehall constantly interact visually, aurally and within the imagination. We believed this mixing of realities would create a more powerful form of Augmented Reality, and the visitor feedback appears to confirm this belief. Over 90% of users agreed or strongly agreed that the experience both “brought the history of the place and time to life” and “made me feel more connected to the place and its past”. One visitor wrote "I was amazed how easily modern life drifted to the background whilst the past became more vivid and alive around me." To have created a ‘vivid’ historical experience of a palace that largely no longer physically exists, suggests our approach succeeded. An approach where a simulated environment such as The Lost Palace is embedded in the reality of a vibrant public realm. It is this entwining of realities that brought The Lost Palace to life. The Lost Palace was is currently shortlisted for an IxDA Award in the Engaging category. It was commissioned by Historic Royal Palaces and was designed by Chomko & Rosier in collaboration with Uninvited Guests, Lewis Gibson and Calvium. It ran from July 21st - September 4th 2016 starting at the Banqueting House in London, the last remaining building of the Palace of Whitehall. The Lost Palace will return in 2017. For more information visit Historic Royal Palaces. This article was originally published on Imperica. “What the inventor wanted”, a stranger helpfully informs me, “is for you to step into the street light and start running around in circles”. He promptly does so, and after a lap or two in the pool of light, points out to me the second shadow that is now running, just in front of him. “It’s like you’re chasing yourself”, he exclaims joyfully, and encourages me to have a go. It feels unkind to tell him at this point that the ‘inventors’ (or designers, as I prefer to put it) are me and my collaborator Matthew Rosier; and, in fact, continuously running in a loop is just one of a surprising and brilliant suite of behaviours that people have been inventing for themselves since Shadowing launched back in September. So, I join in, chasing him as he chases his shadow, and watching passers by delight as my shadow emerges too and starts to chase behind me. "Shadow" me is chasing me, I am chasing him, he is chasing his shadow. The passers by step into the light and start to add swirling shapes to the mix by spinning with their arms out and before you know it, we are all giggling and playing together, stone cold sober (well, some of us), by the light of an everyday streetlight in a grimy alleyway in Bristol. Shadowing was the winning proposal which Matthew Rosier and I put forth to the Playable City Award, a yearly competition run by Watershed in Bristol. The notion of a ‘Playable City’ forwards the idea that technology in cities can serve not only to streamline, optimize and control, but can also be used to encourage play and interaction. It was this view that was attractive to us - that technology does not have a fixed motive, that we can create interventions and infrastructure that support community, interaction, and perhaps even joy. We won the 2014 Award, and in Bristol, between September 11th and October 31st, eight streetlights scattered around the lesser-travelled alleys of the city were given the quality of memory. Walking under these lamps, a second shadow would appear to walk beside yours - the trace of the person previously present. The goal of the project was to enable interaction, through time, between people who share a space. In the beginning of our process, we limited our ideation with a few assumptions. One was that cities are interesting because of the other people. Another was that a successful intervention would need to emulate existing city infrastructure, not appear as a temporary installation or art project. When we started to make the work, we were lucky enough to get hold of some real, disused lamppost heads from Bristol City Council to experiment with. Over a period of 3 months we built, tested and refined the interaction design of our shadows, seeing what felt natural and supernatural. What made the difference between intriguing and unnerving? It was important to us that the experience of encountering Shadowing in an everyday environment felt plausible and legible, albeit extra-ordinary and unexpected. We were particularly interested in what would happen over time when people who passed a Shadowing street light every day got used to living with the exceptional in their built environment. After the launch, we’d visit the locations on rented bicycles to observe the activity. Some were more active than others, yet to visit a location was always exciting - to see the traces of those, to see who had played, who had walked by. One location, up on a hill in Montpelier was often busy, with many different constellations of people through the night. Often, groups would form around the light, and work together to record different patterns. Amazingly, the groups were formed of strangers - a family here, two friends there, a dude walking to the train. One of the highlights for us came when a woman walking a blue-eyed Alsatian called ‘Wolfie’ told us “This used to be a mugging area, but the light has brought people out to play. The muggers don’t come here anymore”. We started to hear back through social media how people were encountering the project and each other on the streets. @helenmanchester: Came across #shadowing last night at Easton underpass- danced with a South American woman and was ranted at by a bloke about surveillance. The question of surveillance culture was an interesting one for us. The technology that we used to record and play back the shadows of those that passed underneath borrowed from CCTV, using IR (Infrared) cameras. IR light exists below the spectrum of human-visible light, yet is visible to certain cameras. Using CCTV cameras and image processing, we were able to capture the walking silhouette. This technique is commonly used in interactive installation work, yet the IR image is used as input into a system, not exposed in its raw form. By making visible our method of imaging, we also raised questions around what it feels like to have the your image not only captured but echoed back to you in public space. Our shadows were designed not to be recognisable as individuals, like the shadows you cast everyday. These were abstract shapes moving through a pool of light that just happens to have a memory and will remember you to the next person who walks past, will dream about you for a while longer (the lamps when left to their own devices would recall a procession of the previous 14 visitors as a ‘dream state’), then forget about you entirely. We didn’t keep the images, and we didn’t share them online or suggest that you find and tag your shadow on Facebook. We were not entirely a filmless camera, however, we do have over one hundred thousand extremely lo-res gifs that we exported from the lamps that show us how many people got involved and in the loosest form, what they did. We haven’t shared these yet but we might, they are kind of great. For us, this project was about an exact moment in time and in place, when something different happened to you, and then melted away, not about its digital footprint. The question of if or how these traces might live on is still on our minds. In terms of what is next, we are working with Watershed to bring Shadowing to cities around the world. We look forward to seeing how new locations and contexts affect the experience and how those who live, work and visit these places react as they encounter the shadows of those who have trodden this path before them. Will immersive storytelling be possible without using screens? Will in the near future an immersive storytelling in museums, galleries and places of historical events still be possible without using screens? Two designers from Chomko & Rosier studio know how to harness the storytelling potential of new non-screen-based digital technologies in a way that does not detract visitors from what makes visiting a place unique. An example of this approach is their project named ‘Heart of a King’. ‘Heart of a King’ is a prototype visitor experience designed by the duo Chomko & Rosier for Historic Royal Palaces, the independent charity in London that manages and cares for six royal palaces in the UK. Their project places visitors in the footsteps and emotional state of Charles I on the day of his execution in 1649. Visitors received a wooden, heart-shaped totem. The device creates a haptic heartbeat that acts as a compass, increasing in strength when pointed to Charles’ last path. Following the heartbeat, visitors trace Charles’ final journey through St James Park and Whitehall, arriving in front of Banqueting House (it is all that remains of the opulent Whitehall Palace, once the largest palace in Europe, a labyrinth of 1,500 rooms), the place of his execution where the heart ceases to beat. On the journey, contextual signage styled as modern street signage gave visitors quotes and further information on 30 January 1649, the day the first English monarch was executed. The heartbeat acts as a link, a universal human rhythm that allows users to enter the physiological and psychological state of the king Charles I before his execution. The prototype of ‘Heart of a King’ processes GPS and orientation sensor readings in an Arduino-based microcontroller to modulate the strength of the heartbeat, giving the visitor an immersive, non-digital experience, guided only by the sense of touch. ‘Heart of a King’ is a part of the development phase of a multisensory experience named ‘The Lost Palace’. The aim of this project is to immerse visitors in the historical events and to retell stories that took place within the Palace of Whitehall, before fire destroyed it over 300 years ago. In summer 2016, visitors of central London will uncover what was once considered the most magnificent palace in Europe. Through technical and theatrical innovations, including 3D audio, which is called by the Chomko & Rosier duo ‘a new form of virtual reality’, the spaces, stories and events from the palace will come to life in a multisensory, location-based experience. I spoke to Matthew Rosier at RE.WORK Future Technology Summit in London in Autumn 2015. If you have any questions regarding ‘Heart of a King’ or any other work by Chomko & Rosier, please feel free to contact Matthew at matthew@chomkorosier.com. This article was originally published on TrendNomad.